The 2014 ranking puts the US first, followed by China, Japan, Germany, the UK, France, Brazil, Italy, India and Russia, in that order. KUALA LUMPUR- The latest edition of Cebr Global’s World Economic League Table (WELT) will see the “unstoppable” rise of India as it surpasses Britain to become the largest economy in the Commonwealth in 2018 and the third largest economy in the world by 2024, according to a new global league table reported by the Press Association. Britain has overtaken France to become the world’s fifth largest economy – and will even outstrip Germany by 2030. Cebr Global predicts that Germany will slide back economically, due to its declining population and the likely weakness of the euro, to the extent that Britain will overtake it in 2030 for the first time since 1954 – when the comparison was with West Germany alone. But if Germany left the euro, the group forecasts that its currency strength would mean that the UK would be unlikely to overtake it until around 2050, by which point Britain’s superior demographics would prove “irresistible”. If Scotland were to leave the UK, Germany would still be well ahead in GDP terms by this point. But economics consultants Cebr Global said that the tiny margin between the UK and France made the result too close to call with certainty. And recent changes mean that the UK gross domestic product (GDP) figures include spending on illicit services such as prostitution and drugs, which are not counted in France. UK GDP in 2014 was 2,828 billion US dollars (£1,820.4 billion) compared to 2,827 billion dollars (£1,819.7 billion) for France, according to the new report. The gap is “well within the margin of error”, said Cebr Global, adding that if France’s markets in drugs and prostitution were included, they may prove to be “larger than their British counterparts”. WELT shows China’s growth continuing so strongly that it is now predicted to overhaul the US as the world’s biggest economy by 2025 – compared to 2028 last year. The World Economic League Table tracks the size of different economies across the globe and forecasts future changes as far ahead as 2030. Its 2014 ranking puts the US first, followed by China, Japan, Germany, the UK, France, Brazil, Italy, India and Russia, in that order. By 2030, it forecasts that globalization will have reached its mature phase, with China installed as the world’s biggest economy ahead of the US and India in third place, followed by Japan, Brazil, the UK, Germany, South Korea, France and Russia. Cebr chief executive Douglas McWilliams said: “The fun of the world economic league table is that it brings things back to hard figures. Countries like Russia and Argentina, who have invaded neighbouring countries and whose leaders spout aggressively nationalistic rhetoric, are brought down to earth by their falls in the league table as their economies collapse. “The World Economic League table also shows the dramatic changes now taking place in the world’s economic geography with slow-growing European economies falling back and Asian economies, even though their growth is slowing, catching up. By the year 2020, India could emerge as the third-biggest country in terms of defense-related expenditure, US-based consulting firm IHS projected in a study published on Friday. India, home to the world’s second-largest population, currently stands eighth in total spending on defense (expenditure, procurement, research and development). 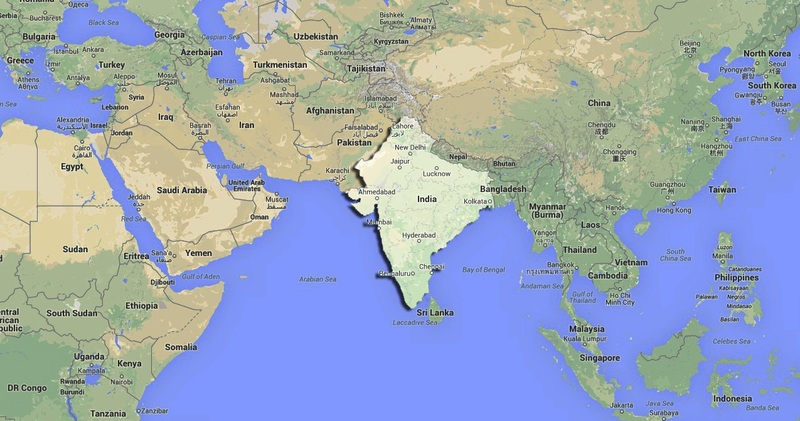 The country in 2014 spent $47.78 billion (Rs 3,01,299 crore), higher than those like Germany, Brazil, south Korea, Italy, Canada, according to the IHS study, where the NYSE-listed research firm analysed specific forecasts for defense-related expenditure by 91 countries and captured 98 per cent of the global defence spend. 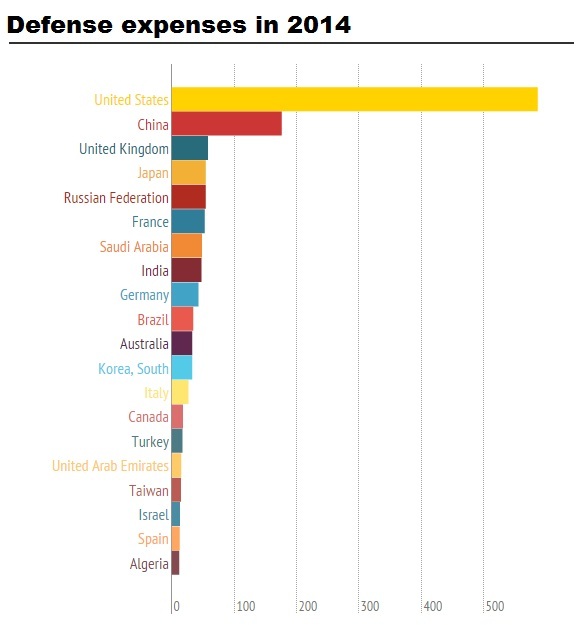 The US, which currently is the biggest spender on defense — it spent $586.92 billion in 2014 — is followed by China ($176.25 billion) as a distant second. The UK, Japan, the Russian federation, France and Saudi Arabia also spent more than India during the year, the IHS study revealed. However, the study points out, though the US will continue to be on top in defense expenditure by 2020 as well, the combined spend by the Asia-Pacific, too, will have risen significantly by then. The region currently spends $170 billion less on defene than the US; by 2020, it will spend exceed the US on this. “Spending in Asia-Pacific, meanwhile, is expected to grow to $547.1 billion by 2020, over 30 per cent of the global total,” said Craig Caffrey, senior defence budgets analyst at IHS Aerospace & Defence. The study also forecast defense spend to flat-line over the next two years, as fiscal constraints among oil-producing states in West Asia and North Africa removed a key source of growth. “By 2019, for the first time in history, the North Atlantic Treaty Organization (Nato) will not account for a majority of worldwide defence expenditure. It accounted for almost two-thirds of global spending as recently as 2010,” said IHS. Nato expenditure was expected to fall in real terms from $869.6 billion in 2014 to $837.9 billion by 2020. By the end of the decade, defence spending would decline from 54.4 per cent of total expenditure to 48.5 per cent, it added. “By 2019, the alliance (Nato) will fail to account for the majority of worldwide defense expenditure… By 2020, the centre of gravity of the global defence spending landscape is expected to have continued its gradual shift away from the developed economies of Western Europe and North America and towards emerging markets, particularly in Asia,” said Fenella McGerty, senior defence budget analyst at IHS Aerospace & Defence. Despite the region not being immune to the present challenges in the global economy, Asia’s defense expenditure growth is expected to accelerate from 3.3 per cent in 2014 to 4.8 per cent next year. Unlike in West Asia and North Africa, falling oil prices were expected to have a net positive effect on economic growth in China, India and Indonesia, and would aid government finances, the study said.